I'd completely forgotten how much I loved making these little Farmer's Wife blocks! It was such a pleasure rummaging through my scrap bins and stash auditioning different fabrics for each one. Thank you Kerry for inviting me this week on the 1930s Farmer's Wife Quilt Along, I don't think I would have got round to making one if I didn't have a special post to write. I really love the new addition of the miniature diagram thats included on the pattern page of each block. How fun. I know this is used for foundation paper piecing directions, but I thought it might be a nice memento for a quilt journal with some watercolour paints perhaps as well? Says the girl that hasn't even finished all the blocks from the first quilt? I know, I know. 1930's Kona Solid Fat Quarter Bundle, available at Sew and Quilt. I digress, back to the #23 Charlotte block, which you can find on page 182 of the book. I rotary cut and machine piece, as I have done with all my FWQ blocks. There are rotary cutting templates provided, in addition to the foundation paper pieced ones. Just print them out on regular paper (they have a 1inch size guide on the page so you know you're printing out at the correct size, which of course I didn't on first time, oops. I succeeded on second attempt by selecting the US Letter page size in my printer - you might want to also use something like 'do not scale' etc). Most often I will dig through my stash as they are such tiny pieces you really don't need much. If I use yardage I'll rough cut a strip larger than the template and rough cut a larger shape than the template. I will often fold the strip to double over, depending on how many pieces are required for that fabric/shape. I usually stack about 2-4 pieces (depending on how sharp my rotary blade is) and trim off the excess, lining up with the edge of the template. Turn and cut, turn and cut, being careful not to shift too much. I use a mini rotary cutting mat that spins, not sure why it didn't make the picture? Once you're all prepped you're ready to go. Chain piecing makes life much easier here. Once I'm done with the chain I'll bring it straight over to my iron for pressing (without too much handling) and trim the threads while at the iron station to save time going back and forth. And here she is all finished! I went for a different colour combo than the book version. I used Corn Yellow Kona solid, which is a really bold yellow that packs a punch, alongside an old Mother's Melodies print I used to sell a few years back in the shop. The opposite side is my favourite green, Aloe Kona solid and a matching Pretty Posies print by Darlene Zimmerman. 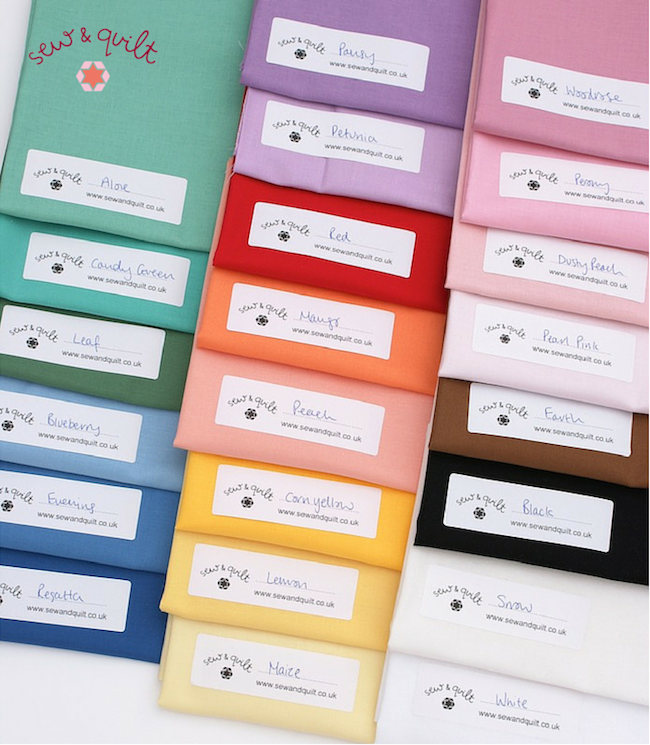 I have a popular Kona bundle I put together for Sew and Quilt, which is a complete FQ bundle of all 22 official 1930's Kona solids. They are perfect for this QAL! Of course I couldn't leave without sharing some 1930's repro eye candy from Sew and Quilt with you! *plug, plug, plug*. 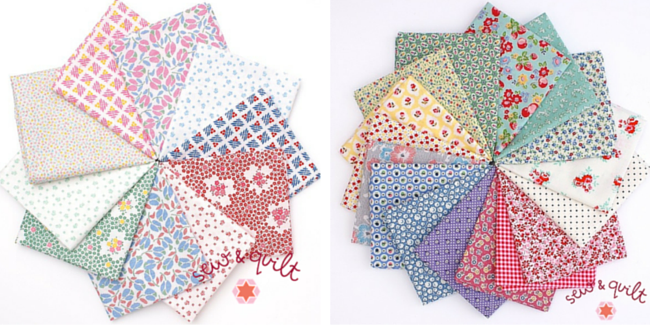 On the left is the delightful Pretty Posies FQ bundle, it's subtle and sweet without bring over the top, plus it's 10% off ;-) On the right is a special Farmer's Wife FQ bundle I put together for the release of Kerry's QAL. What a great bunch hey?! 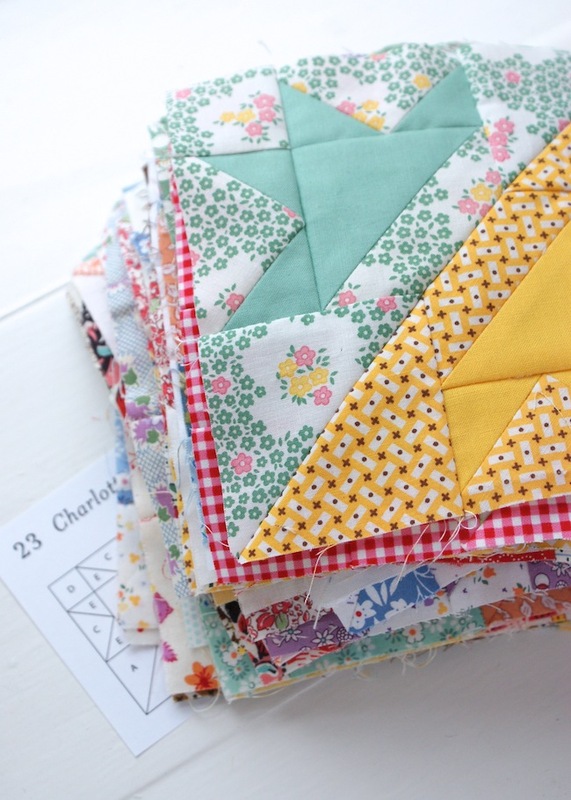 If you fancy joining in VeryKerryBerry's QAL, you can find all the details here. 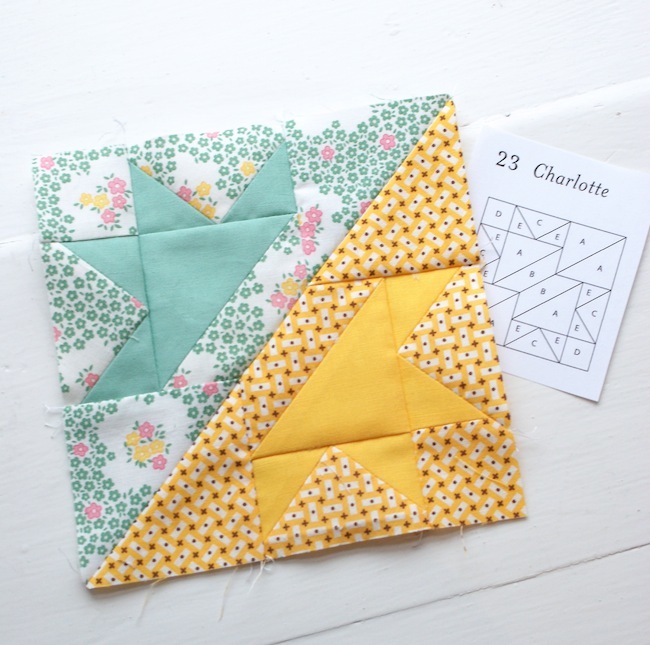 Kerry has lots of helpful tips and information on making the blocks using the foundation paper pieced method and other bloggers have been hosting to share their tips on the different methods of construction also. There is also a very useful errata page thats kept up to date so do take a look. (I reported no problems with my block). Such a lovely block, great fabrics used too. What a fantastic block I will have to try it. Thank you Jessie, for these tips. I commenced my FW quilt a couple of years ago. I found it fiddly grrr. So it is packed away inna box, all cut pieces are labelled. However, when I unearth the box, I shall take it up again, and use your mosr useful tips. I only hope the blocks I have sewn are salvageable. That's helpful. A revolution has taken in place in the cutting of fabric for sewers across the world. 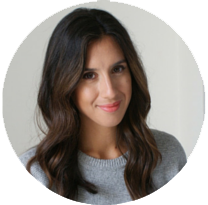 The rotary cutter is the basis of this exciting trend. This sewing tool makes cutting fabric more precise, less wear and tear on the users hand and wrist, faster, easier, and safer. هر کسب و کاری برای ورود و یا پا برجا ماندن در دنیای رقابت نیاز به تبلیغات دارد . تبلیغات به شیوه های مختلف سنتی و تبلیغات مدرن انجام می شود . هر کسب و کاری بر اساس حیطه کاری خود ، مشتریان ، رقبا ، آداب و رسوم ، فرهنگ ، جنسیت مشتریان ، سن مشتریان و غیره از انواع روش های تبلیغاتی بهره می برد . تبلیغات به شیوه های قدیمی و مرسوم مانند چاپ بنر ، پوستر ، تابلوهای تبلیغاتی نظیر تابلو چلنيوم ، تابلو حروف برجسته ، طراحی و ساخت بيلبورد ، تلويزيون شهری ، تابلو ال ای دی و تبلیغات به شیوه مدرن مانند تبلیغات در سایت ها با رتبه بالا ، تبلیغات کلیکی ، تبلیغات چریکی ، تبلیغات سمپلینگ ، تبلیغات وبلاگی ، تبلیغات در شبکه های اجتماعی می باشد.